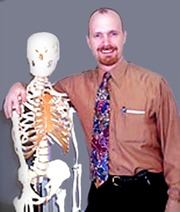 Dr. Barry Wahner has been practicing Chiropractic in Philadelphia since 1991. Over those years he has helped thousands of people improve their health and "feel a lot better". He has a holistic approach to healing ~ he works to find the cause of a person's illness and to remove that cause. In his practice Dr. Barry uses several healing techniques including spinal adjustments, trigger point therapy and manual muscle therapy. He also offers professional advice on exercise, injury avoidance and nutrition. Dr. Barry has a personal background in sports and athletics and he studied to become a Certified Chiropractic Sports Physician. He likes to help people "maximize performance" whether that be in sports, work or life. Click here to see a video in which I talk about the value of chiropractic care. about Dr. Barry's practice or how Chiropractic can help you.